GraphenTech, a company based in the Netherlands that produces Graphene (from 2 to 7 layers), has come out with a rather surprising announcement: It will be distributing free graphene samples to companies or research organizations looking to develop graphene-based products. The Company explains that the objective of this initiative is to prepare future collaborations before producing graphene at a large scale after the success of its Initial Coin Offering (ICO). Chinese coke company Baotailong New Materials has completed construction of a USD$9.6 million graphene production project in the north of the country and has launched trial-stage operations. Baotailong completed all work on the facility located in its hometown of Qitaihe in northern Heilongjiang province at the end of last month, the firm said in a statement. The plant boasts an annual graphene output of 50 tons. XG Sciences has announced the completion of the first phase of expansion in its newest 64,000 square-foot facility. The expansion has added 90 metric tons of graphene nanoplatelet production capacity, bringing the total capacity of the facility up to approximately 180 metric tons and enabling the formulation of up to 18 million kilograms of advanced materials per year. Phase two of the expansion is expected to be complete by year-end and will result in up to 400 metric tons of total graphene nanoplatelet output capacity at the facility. 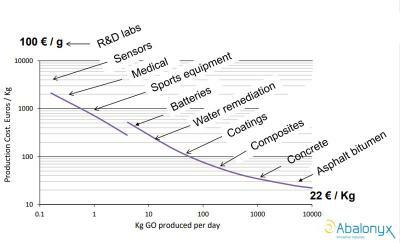 XG's total graphene nanoplatelet output capacity across both of its manufacturing facilities currently exceeds 200 metric tons per year and will more than double over the next three months, reaching up to an approximate 450 metric tons by year-end. The expansions support XG’s mission to continue commercializing the use of graphene in customer products across diverse industries. Leading Edge Materials has reported the signing of a non-binding Letter of Intent with Swedish company Graphmatech. The LOI defines a pathway to form a binding Joint Venture between the companies to produce graphene at Leading Edge Material's Woxna graphite mine. Norway-based Graphene Oxide developer Abalonyx says that there is a strong interest in graphene oxide (GO) solutions in the research community, across a wide range of applications. While first industrial adoption is "on the horizon", Abalonyx estimates that industry acceptance is strongly related to cost. Abalonyx' current production cost is around €800 per Kg (dry weight basis) - since the Company's GO is currently used by researchers and early R&D efforts. Abalonyx estimates that as production volume goes up, the price of production could reach around 22 Euro / Kg - which will make GO applicable for areas such as concrete and asphalt. The projection is based on the company's own extrapolation of today's capacity and the effect of full-automation. The cost does not include waste handling (although Abalonyx believes that it will be able to handle that at no cost). Abalonyx is currently selling its GO at €1,300 - €4,000 per Kg depending on amount and grade (€1.3 - €4 per gram).